JUMLA, Aug 4: The air passengers in Jumla are in dismay after air service could not be regulated between Jumla and the province capital, Surkhet. With the lack of such a service, air passengers are forced to travel to Nepalgunj in order to travel back to Surkhet. 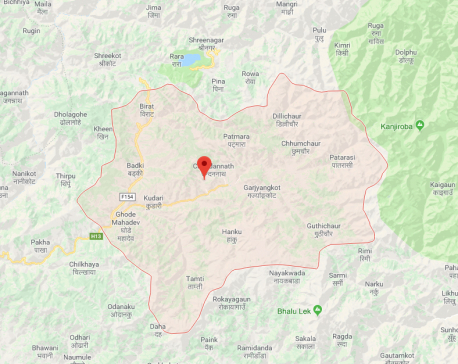 Locals of Jumla have expressed their aggression towards the province government for not being able to connect Jumla and Surkhet through an air route. The entire Karnali Highway which connects Jumla to Surkhet is unusable due to heavy rainfall and landslides. Since the locals need to go to the province capital for various works, the only means of reaching Surkhet during monsoon is through air. It costs Rs 5,414 to travel to Nepalgunj from Jumla and Rs 5,314 to travel from Nepalgunj to Surkhet by air. Even though it would cost very less for a direct flight from Jumla to Surkhet, flights on this air route have not been started. Air service companies had previously opted out of running the flight complaining that most of the locals would prefer to travel on road rather than planes and hence there would be scarcity of passengers for the flights. Previously, the price of a flight to Surkhet was determined to be Rs 4,100.